Shamanism has become a very popular word, and even though the word shamanism originally was used to refer to ancient religions found in some regions of Asia, it is today a common umbrella term including earth-based, indigenous cultures all across the world. Shamanism is considered the worlds oldest religion, it predates written history, and the shamans are thought to be the very first medicine people to walk the earth. Today, shamanism is in short used to describe any religion that includes a nature based belief system, referring to any religious or spiritual path which embraces the Earth as Divine, making Pachamama, our Mother Earth, the center of the spiritual practice. These belief systems usually include an animistic (the belief that all of nature; trees, animals, streams, rocks and other natural phenomena, as well as the universe itself, has a Divine soul within) and a pantheistic (the belief that the Divine is everywhere and in everything) world view. But Mother Earth is not necessarily the only Deity who is worshiped. Most shamanic practices around the world are also polytheistic, meaning the Divine is honored in a variety of Divine forms, including Goddesses, Gods, and other spiritual forces, different and earth-based religions around the world honor a number of different deities. Nature based spirituality are in general known to be open and including, rather than secluding, and where other, more rigid, religions may tell you who or what to worship, most earth based worldviews let you honor and celebrate the deities that speak to you, your heart and your path. A read thread for all practitioners of the old religions, though, is that they all seek to live in harmony with the planet and have a deep love and respect for the life and cycles of Mother Nature and all her creations. Another common view in many earth based religions is that of the God and the Goddess, symbolizing the male and the female force that all life is built upon. The Goddess symbolizes all Goddesses – they are simply different aspects of her – and likewise with he God. And even though you may have an affinity toward either the male or female force, they are usually considered completely equal, as one cannot exist without the other. The God. The God is the Sun or The Horned God. He rules animals, the forest and the sexuality and reproduction, and is connected to the element of fire (the sun), bringing passion and light. He is also associated with the harvest of the food provided by Mother Earth Harvest of the food provided by the earth. His annual journey around the Earth (which is really the Earth around the sun) is marked by the eight Sabbats of the year. He is connected to the Tarot’s suit of wands (air) and the suit of swords (fire). The Goddess. The Goddess is the Moon often called the Triple Goddess or the Triple Moon Goddess, symbolizing the three stages of life; the maiden the mother and the crown, and the three phases of the moon. The maiden is represented by the crescent phase of the Moon, and is where the Moon waxes towards full. The maiden is also associated with the season of spring, where seeds are planted. The mother phase is represented by the Full Moon, the monthly Esbats, and is considered a time of abundance. The mother aspect of the Goddess is said to be the most powerful aspect, and is associated with the blooming season of summer. The last aspect of the Goddess – and the most feared – the crone. At this time in our life cycle we are filled with the wisdom of a full and productive life, and we prepare to let go once more, as the Moon completes her cycle, once again waning towards the darkness and death before the maiden is reborn, once again, at the new moon. All in all,the Goddess is the Earth Mother who sustains all life, allowing it to flourish. She is the ruler of the earth, the ocean and the moon, and is associated with deep emotions and abundance. She is connected to the Tarot’s suit of pentacles (earth/abundance) and the suit of cups (water/emotions). Lastly, the use of ceremony, rituals and are usually the core foundation of most shamanic practices, and as we move through the wheel of the year marking and celebrating the cycles of the Moon (the Esbats) and the festivals of the Sun (The Sabbats), we learn to honoring the natural cycle of life and death, reconnecting with the Divine essence of life, as well as Mother Earths role in our existence. I am initiated into the lineage of the Pampamesayok, the earth keepers of the Andes. Pampamesayok is also the second shamanic initiation rite, or the second level of Andean shamanism, and it is where you officially become a mesa carrier. 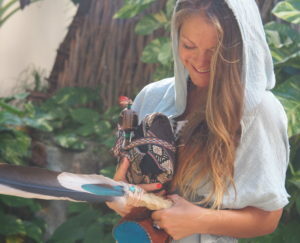 In this tradition, the shaman earns his or her altar – the mesa – during the course of his or her own healing, as it is said that first when you have cleared out all past imprints; when you have had the courage to face your shadow and heal your trauma, can the shaman become a healer. Thus, in the healing process of the shaman, karmic imprints and toxic sludge are cleared from the persons aura – the luminous energy field surrounding our body – and the chakras, and each stone – called a kuja – in the shamans mesa represents a wound that has been transformed from a wound of pain into a source of wisdom and healing and becomes a part of the shamans medicine kit, used in the process of healing others through shamanic energy medicine. There are seven levels of Andean shamanism, and at this pint I have received the four first initiations. Ayni Karpay – student comes into proper relationship with nature. Not yet considered a shaman. Pampamesayok – here the student becomes a mesa carrier. She has assembled her collection of medicine objects – kujas. The duty is to the stewardship of Mother Earth. Altomesayok – translates to high-mesa-power. The responsibility of the Altomesayok is to the sacred mountains – the Apus – and to the medicine teachings. Kurak Akuyek – consists of the words “elder” + “to chew”, and literally means that you are “chewing wisdom” for others to more easily digest it. The shamans duty is to the stars. The three last rites are known as Inka Mailku, Saha Inka and Taitanchis Ranti. These rites are said to be more refined than the lower four, and few shamans ever acquire them. While the Wiccan/Pagan Sabbats are connected to the sun and the turning of the wheel of the year, the Esbats are connected to the moon cycles. There are twelve Esbats through the year, and each are connected to a Full Moon.